It will be played in DY Patil Stadium located in NaviMumbai. It is going to be the bottom of the table clash on Thursday as both the team are lying at the bottom of the ISL 2015 points table this time. And having some unfinished business to be taken care of. Both will fight till the end and give their 100% to fetch all the three points. 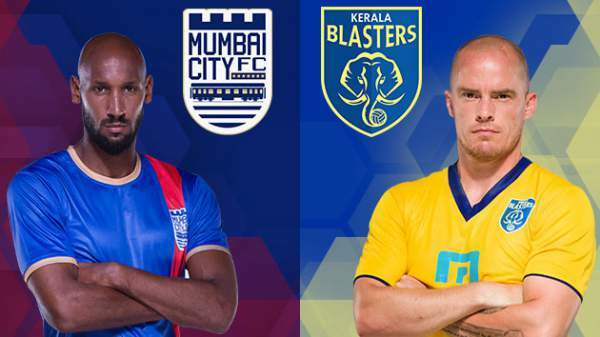 Mumbai is lying at the 7th position in the league table having 12 points earned so far while Kerala are at the bottom with just a total of 11 points which it earned from the same number of matches. The side of Nicolas Anelka seems to have been frustrated to the very bottom as they haven’t registered a single victory in their last five games. The duo and the best combination of the team – Sunil Chhetri and Sony Norde fared very well in just three games this year. After the three win, their magic seems to have been overshadowed. Talking about Kerala Blasters, then they lost their last match against Chennaiyin FC which was a high on nerve match. A highly volatile South Indian derby hit hard. However, they can recover by winning this match. Speaking of just the records then, both of them have won the same number of matches till now. However, Mumbai got to sit one position higher because of the better performance of its star players. Thus, by looking it, no one has considered the form of the team of Anelka. On the other hand, the team of Terry Phelan has won its last matches in the league. Looking at all the stuff, it seems that the football fans will enjoy the every bit of the today’s game at the end of the day. While, Mumbai also has to gain three more points from the upcoming three matches. Thus, Anelka is looking forward and figuring it out how to get them to stay in the race. He is trying his best to give the team directions rather than just being a part of the match as a player only. “If you look at the situations — when I’ve played and not played — we’ve been better when I’ve not played. So, I may put myself on the bench. I will be trying to concentrate on coaching,” said the Frenchman. The Chennai vs Kerala football match is scheduled to start at 7 pm IST. The following television channels will make the game available live online – Star Sports 2, Star Sports HD2, Star Sports 3, Star Sports HD3, Star Utsav, Star Gold (both Hindi), Asianet Movies (Malayalam), Jaya Max (Tamil), Suvarna TV (Kannada) andJalsha Movies (Bengali). While, the live stream option is available on HotStar and StarSports.com. The audiences living in the Middle East and North Africa can watch the game live on OSN with the live streaming option on OSN Play. Talking of the US and Australia viewers, then it can watch on Fox Sports and the live stream is available on FoxSoccer2Go and FoxTel. Stay tuned to us for latest ISL news and updates. Do return here after the match to get to know the result, scorecard/scoreboard highlights video and much more.